Rev. Fr. Dr. Innocent Nwafor, the parish Catholic Priest of St. Micheal Awgbu, Awka diocese, has pointed out the rationale behind his display of benevolent on distinguished students of Santa Maria nursery and primary school, Egbeani-Ezeawulu Nibo. One of the reasons he gave was that the poor amongst the distinguished students can sell the goat for school fees and purchase books that will assist widen his scope of knowledge. 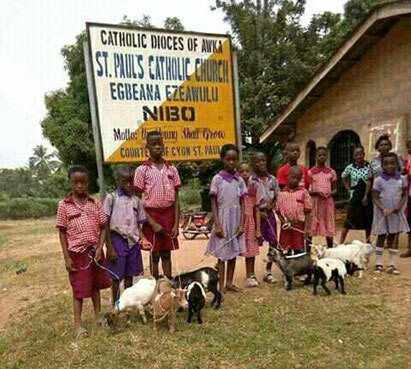 Recall that last weekend, a school in Anambra state splashed gifts (Goats) to outstanding students for distinguishing themselves academically in their various classes. However, when asked on how it started, Fr. Nwafor said, “actually it is an initiative of an NGO called ‘ORA’ based in Austria going on in some Africa countries like Ghana. An office of the NGO happened to be in the community where I worked for some time. Through a friend this was extended to Nigeria”, he said. However, when quizzed on why the choice of ‘goats’, he opined, “It makes the children to be down to earth. “In Awgbu where the program has been going on for three years now, some children are learning for the first time the various kinds of goat’s food. “Secondly, for economic value: The children learn to take care of animal till it begets younger ones. The child sells it and uses the money to pay school fees if in private school or buy novels etc. “However, they develop their affective domain as they learn to show care to the animals. In that way they can better develop their caring sensibility to follow human beings. “It will equally help them to develop positive self image. They look at the goat and feel that’s the fruit of my handiwork. I will work harder.” Speaking on the diagnostic measures to reduce the level of poverty and increase the level of education in the school, Fr. Innocent said, “A lot still needs to be done to bring the school to higher pedestal. “Things like computer, white board, standard tables for teachers. Scholarship in various areas of excellence but I think the school manager can speak better in this regards”, he finally said.